In case my Southern California readers weren’t aware of this, the biggest (or arguably biggest) Nerf War on the NIC Modding Community is coming up this Saturday, June 21 2014. This has been a long time tradition (we’re on number 15 now!) with usually someone SCUN related hosting them. This year it’s a bit special, we have Langley (one of the Nerf Haven Forum Creators) flying in from New Jersey to host and play! We also have people coming in from the Arizone, Utah, and San Francisco areas. In case your not familiar with what the NIC is, it stands for Nerf Internet Community. While the internet has connected and help popularize “mainstream Nerfing” (Nerf with clip/mag fed blasters, Nerf blasters being modded and used for Wars) the term NIC within the NIC usually stands for blasters exhibiting higher power. Blasters and darts are often homemade. What rate of fire and ammo capacity is a little behind most Elite blasters, they make up for in range and accuracy. I’ve been playing Nerf for about 5 years now, but I’ve never been to an Armageddon event. This year, I plan on changing that! I want to get better as a player, an event organizer, and experience a little different side of Nerf. Feel free to come and play Nerf, say hi to me and other Nerfers, and generally have a good time. I’ll be the guy wearing a panda hat and something panda related. 32 different people have marked themselves down as going on the Nerf Haven Forum topic, and some people are even bringing or inviting more. To check out rules and what you need to bring, and see who’s marked themselves down as going, look at the rest on the post below or read here. You can view the weather forecast for that day right here. For a few videos of past events, check out SCUN’s Youtube channel. Keep an eye out on my blog and Youtube channel for my loadout video and what I plan on bringing to the event. If you haven’t heard of Xplorer (can’t believe I’ve never posted about them on my site) their a Singapore Nerf Company specializing in modifying plunger based blasters for Stefans. The Longshot & Stampede are their most extensive work. They feature blaster kits, accessories, springs, and more on their site. Their Longshot Ultimate Upgrade Kit is said to go over 260 FPS (Feet Per Second) on their site. To put that into perspective, most modded flywheel blasters go about 85-110 FPS. Airsoft Guns indoors in Southern CA are often limited to 300-350 FPS. While I’ve never bought anything from them (in part to their high prices) I did want to let you guys know about an event their hosting on June 8, 2014. Instead of a usual or assumed Nerf War of some sort, their doing a shooting/target challenge. People who enter must go through a timed challenge in which they shoot targets and try to compete for the highest times. You can RSVP and view the rules on their Facebook event here. And the prizes? Their looking great. The top five finishers all get a prize of some sort. 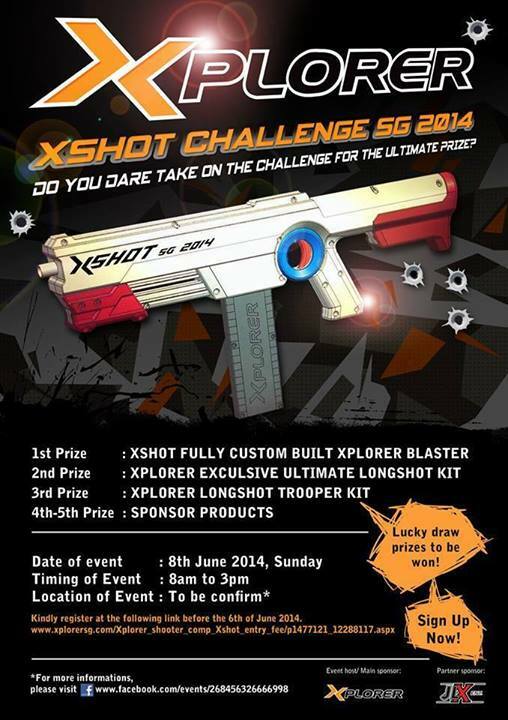 1st Place: A Xshot Xplorer blaster. This is a new homemade blaster from the company, and details are scarce on it. However, you can view more information in this teaser video. Entry fee is 60 Singapore Dollars. You can sign up on their site here. It’s always a great thing to hear when Nerf Wars & Nerf Events are planned, and just as good when they go through without too many negative incidents. I hope their event goes well!